While a dog kennel may be a nice spot for Fido to lounge when owners are away, kennels are not a home décor friendly item. It is hard to find a space where the kennel is not an eye sore and not interrupting the flow of a home. However, we have a wonderful solution! 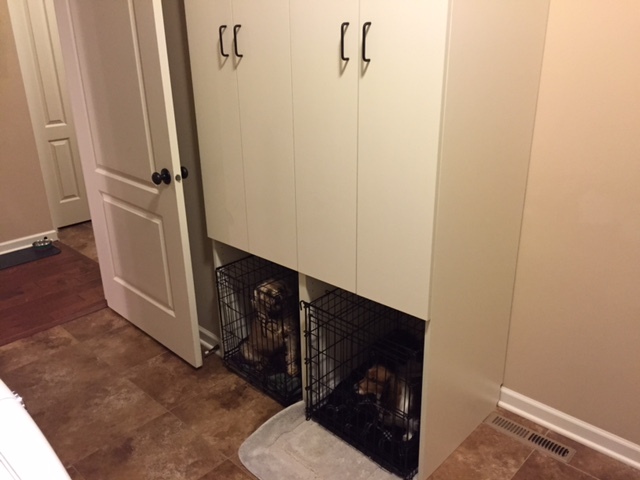 We recently completed a mudroom organization system with built in spots for two kennels. The built in kennel slots are designed with a bit of space to allow air flow (we don’t want Fido to get too warm) while keeping the kennels tucked away and out of sight. Situated under a custom coat cabinet, the mudroom location allows the homeowners to conveniently tuck the puppies away as they are leaving the house. Love this idea? Closets For Life is a custom organization company serving Minneapolis & St. Paul. We offer free in-home consultations and can help design an organization solution that perfectly fits your needs (and your pets!). Contact Closets For Life today!